An anonymous tip has been received that David K. Willett’ s hair may be short or shaved. He was recently seen on Māmane Street in Honokaʻa. Police ask anyone with information on this individual to call the Police Department’s non-emergency line at 935-3311. Hawaiʻi Island police are asking for the public’s assistance in locating a 30-year-old man wanted for outstanding bench warrants. This individual has no permanent address but frequents the South Hilo and Puna Districts. 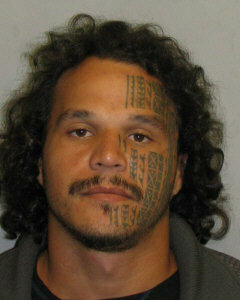 David Kamanao Willett, described as 5-feet-7-inches, 168 pounds, brown eyes and black hair with several tattoos to include a tribal design completely on the left side of his face. On (May 18), a 41-count bench warrant was issued following a grand jury indictment charging Willett with continuous sexual assault of a minor under the age of 14, 19 counts of first degree sexual assault and 21 counts of third degree sexual assault.